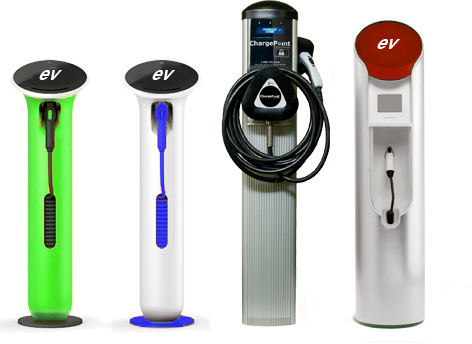 There are several types of electric car charging facilities available. An electric vehicle charging point or charging station is an infrastructure that supplies electric energy that is able to charge a pure electric or plug-in hybrid electric vehicle. The number of these charging stations is increasing across the UK with the expansion of the charging networks and schemes. Many of the on street charging facilities, are provided by electric utility companies and other facilities are provided by retail shopping centres and operated by many private companies. Find your nearest EV charging point her at our charge map. 1.Residential home charging stations where an electric car owner can plug-in their vehicle at home and allow the vehicle to charge during the day or overnight. Some of these would be wired in using their own designated circuit, and generally will be made up of a wall mounted charging unit. For home installations there are government grants towards the cost, here is a list of approved installers. 2.Charging while out and about in public charging stations are generally offered by various charging schemes. These facilities do vary in speed and connection types so it is worth checking their website before you plan to use their facility. They try and encourage EV owners to recharge their cars while taking making use of nearby facilities this can be in car parks, shopping centres, train stations and bus depots. 3.Fast charging and public charging stations, these such as Tesla superchargers can deliver a 60 mile range in the little as 10 to 30 minutes depending on the charger. These types of chargers may be situated at rest stops to allow for longer distance trips, and may also be used by commuters in urban areas for charging while parked for short periods. 240V AC charging is known as level 2 charging, and 500 V DC current charging is known as DC fast charging. Level 2 charging solutions can be installed at home, while businesses and local councils can provide level 2 as well as DC fast charging at public charging stations as these require a higher capacity mains supply. Mode one- Slow charging from a regular three pin socket, charging lead. The vehicle is connected to the grid using a three pin socket, which is usually rated between 10 and 16 Amps. Electrical installations must abide by electrical safety regulations. There are several limitations which include heating up of the socket, increased charge time due to low power output and the tendency for circuits to trip. Mode two- Slow charging from a regular socket that has been equipped with an electric vehicle specific protection facility. The vehicle is connected to the main power grid via a household sockets. Single phase or three-phase network will deliver the power. A protection device is integrated into the cable. This is a more expensive and more efficient and safe option. Usually vehicles ie the BMW i3 will come with this type of charging lead. Charging will take between 6-8hrs depending on the vehicle. Mode three- Slow or fast charging using a EV multi pin sockets with protection functions. The car is connected to the electrical network from a specific socket. A control and protection function is installed into the installation. This installation also allows load shedding so electrical household appliances can be operated during vehicle charging. These usits are usually wall mounted and offered in both 16 and 32 amp options. We recommend this method for home charging if you own an EV and currently the government will pay 75% towards the installation, follow this link for furthur information government incentives for EV charging. Direct current DC the electric vehicle is connected to the mains power grid through an external charger both the control and protection functions are integrated into the charging facility. These systems will be usefull when out and about, find out where these networks are. Type I- A single phase vehicle coupler. Type II- A single and three phase vehicle coupler. Type III- Single and three phase vehicle coupler equipped with safety shutters. Type IIII- A charging coupler to a special systems such as the Tesla superchargers. Qualcomm, the California-based global mobile and wireless technology leader has taken a huge step forward in the UK towards the development of wireless charging for electric vehicles, by making a strategic investment in Chargemaster plc, the country’s largest manufacturer and operator of electric vehicle charging points. The move is said to help bring about a significant step-change in the practical everyday operation of electric vehicles. The company says that it should see an acceleration of the planned UK development, production and deployment of Wireless Electric Vehicle Charging (WEVC) technology. Luton-based Chargemaster designs, develops, manufactures and operates charging points for electric vehicles and boasts the UK’s largest network of public charging points with 27,000 charging points across the country via its POLAR network. In addition, it also provides charging points for workplace and domestic locations. The company is forecasting a significant growth in the market for charging pads across all customer bases to supplement the company’s existing EV charging network. The company says that it has already installed 10,000 ‘wireless ready’ public and workplace charging points in the UK and Europe. These can be easily adapted to include the new WEVC systems. The Qualcomm Halo WEVC technology utilises resonant magnetic induction to transfer energy from a ground-based pad to a pad integrated into the vehicle. The base pad and vehicle pad are coupled magnetically and energy is transferred wirelessly into the vehicle and used to charge the vehicle’s batteries. The base pad may be mounted on a garage or road surface or buried below the ground. This advanced technology is highly efficient and is designed to allow easy alignment when parking. Wireless charging removes the need to retrieve a cable out of the boot of an electric car and plug it into a charging point wherever the car needs recharging. Many car manufacturers are planning to incorporate wireless charging into their electric and plug in hybrid cars as original equipment in the near future.